The Tennis Channel Plus moves from delivering live and on-demand French Open video content played on clay to streaming the race to Wimbledon on grass courts thanks to NeuLion® end to end IPTV service technology. The Sports Techie community blog chatted with Adam Ware, SVP and Head of Digital Media at The Tennis Channel in CA, and Chris Wagner, Executive Vice President and Co-founder of NeuLion located in NY, about their new multi-year agreement designed to increase business opportunities and fan viewership by allowing digital access to more live matches for both casual and hard care fans on more devices. Tennis Channel is using NeuLion as a product and service provider to pioneer a successful and innovative streaming approach for live and on-demand sport while changing the space for sponsors, players and end users all over the world. The Wimbledon grand slam is next up for a big month for tennis fans across the nation. The Tennis Channel Powered By NeuLion Delivers Wimbledon Streaming Video Directly To Fans – SportsTechie blog. The Tennis Channel is the only 24-hour programming network dedicated to tennis and the most established single-sport offering across television and the web, Apple TV and Roku, and mobile (iOS and Android) accomplished thanks to NeuLion technologies. American tennis fans can live stream the Tennis Channel (or it is free to Tennis Channel subscribers via participating TV providers), use their on-demand library featuring full-length matches and original programming, and pay for live streaming of an add-on OTT subscription network called Tennis Channel Plus. The two companies have agreed to collaborate on expanding to new markets and additional devices, following the success of the 2015 French Open on Tennis Channel Everywhere and Tennis Channel Plus channels powered by the NeuLion® Digital Platform. As a result, the innovative OTT strategy that NeuLion partner the Tennis Channel is deploying to drive more engaged viewership following last week’s French Open is setting a new standard in the sports industry. 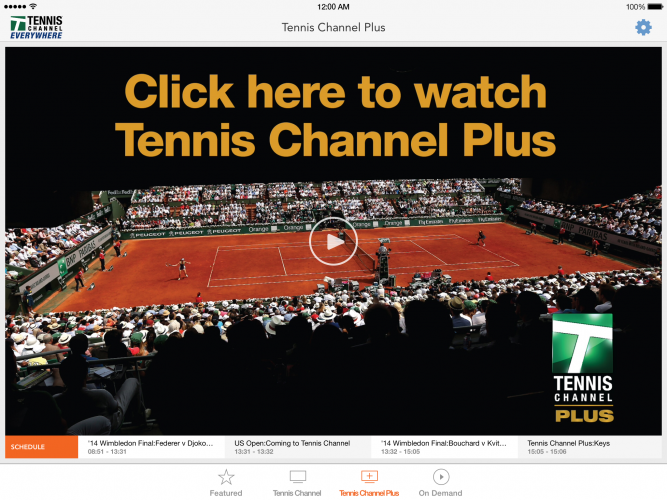 Tennis Channel has seen a 400% year-over-year increase in subscribers to Tennis Channel Plus, a subscription OTT service powered by NeuLion that provides comprehensive and exclusive content on any device. By utilizing the broadcasting, distribution and monetization of live and on-demand digital video content to Internet-enabled devices, the proprietary service is considered sticky because over 25 percent of subscribers are using the tech every day on multiple devices while 50 percent stream video on their computers, 25 percent on tablets and 15 percent on media streamers such as Apple TV and Roku. Finally, 10 percent are using a mobile smartphone. Expect all these numbers to increase. The fact is, Tennis Channel has built a successful OTT service while also growing their authenticated Tennis Channel Everywhere service which gives cable subscribers access to linear content on PC, mobile and tablet platforms. By championing these two services, NeuLion aggregated the delivery of more than 260 hours of French Open coverage for the Tennis Channel, including 140 live matches and encore replays, together with 120 hours of the nightly primetime show French Open Tonight all via the NeuLion® Digital Platform. 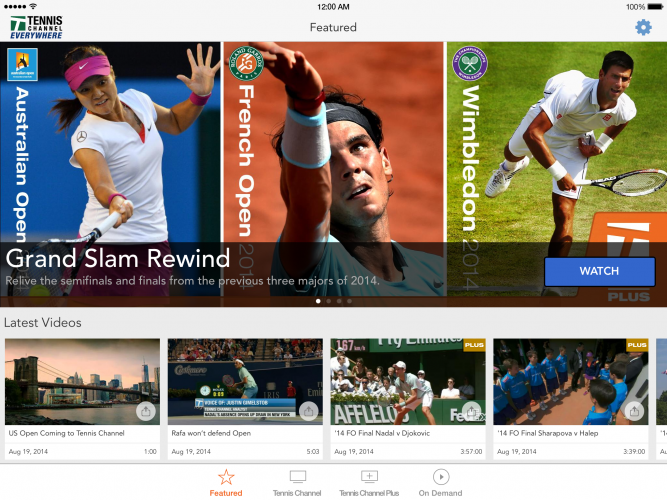 Tennis Channels Gets Creative with Content Rights: Streaming Subscriptions Up 400%. Fans of the Majors, Davis Cup and Fed Cup are migrating to Tennis Channel Plus. Tennis has no season and play goes on all year except for a lull in December. 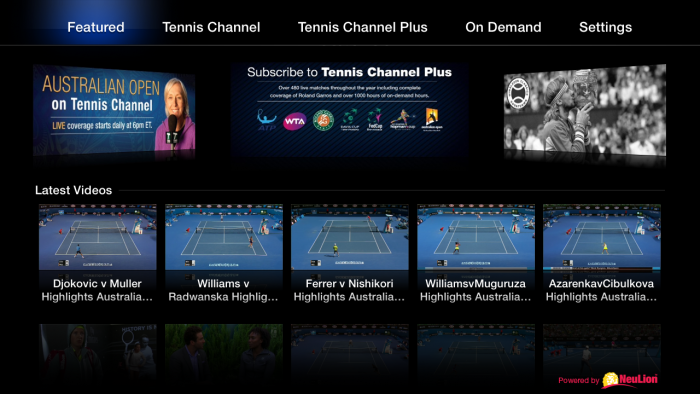 Tennis Channel Plus offers 650 plus live events, more than 1000 on demand hours over a 24/7 channel. The Annual Pass goes for $79.99 a year giving purchaser’s access to all of Tennis Channel Plus content including live matches from over 45 tournaments throughout the year including the 2015 French Open Mosaic. Annual Pass is valid for one year from date of purchase and includes access to the Tennis Channel Everywhere App on iOS, Android, Apple TV and Roku devices. The Monthly Pass costs $11.99 a month. 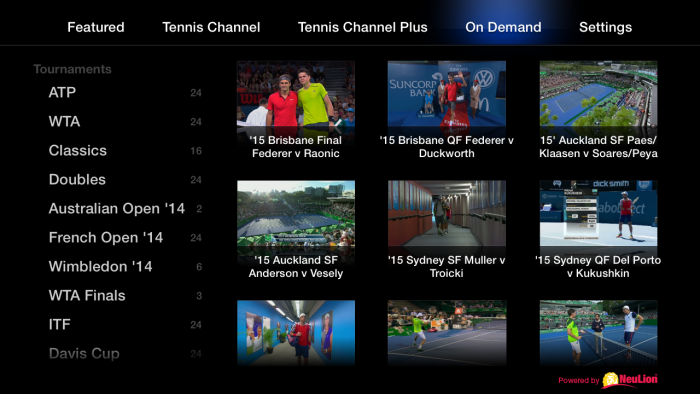 It gives access to all of Tennis Channel Plus content including live matches from 45 plus tournaments all year long. Monthly subscribers also enjoy the same access on the Tennis Channel Everywhere App for iOS, Android, Apple TV and Roku devices. I wanted to know if they have seen a spike in one off subscribers meaning fans that buy a monthly subscription so they can view the Australian Open, French Open, Wimbledon and U.S. Open rather than go for the yearly deal. Ware replied, “Monthly are about 65% of the Tennis Channel subscriber totals, but our season pass offering is evolving and drawing more interest” Churn on a monthly basis is better than their monthly average. If a subscriber stays for six months it equals to 12 months, according to Ware. Learn more about Tennis Channel’s hybrid TVE/OTT model directly from Adam Ware, Tennis Channel’s Head of Digital. Live broadcast starts at 1pm EST on June 22, 2015. Register now. NeuLion, Inc. (TSX: NLN) enters their 11th year of building a digital platform for private broadcasting networks operating over the Internet with enterprise level service. By utilizing the public Internet, content can reach viewers anywhere in the world via an OTT delivered linear channel. NeuLion have tech specifically built for content companies with goals of reaching a specific market or broadband providers wanting new consumer-driven applications for content and subscriber management, digital rights management, billing, customer service, reporting and delivery. NeuLion® Digital Platform is behind the Tennis Channel everywhere and Tennis Channel Plus delivery by facilitating the end-to-end IPTV distribution, encoding and monetization of content security and monitoring while streamlining the content delivery process. NeuLion has technology solutions designed for 4K streaming of premium sports, entertainment and global content companies enabling the highest quality digital experiences for live and on-demand content on any device. Established brand partners such as the MLS, NFL, NBA, NHL, Univision and UFC, Rainbow Media and Dish Networks as well as major consumer electronics manufacturers and software companies use their OTT and TV Everywhere services. Last year, 50,000 live events were provided by NeuLion. For more information about NeuLion, visit www.NeuLion.com. New agreement expands relationship to include access to more live matches for more fans on more devices. For example, the problem with professional tennis is during a tournament, there is lots of live tennis being played that consumers want to watch at their leisure. The MLB At Bat app model for out of market viewership has been a success. FIFA fans like to follow certain players or countries during a World Cup broadcast and NCAA March Madness fans want to follow the college basketball teams they picked in their bracket in real-time so they use apps. It reasons then that tennis viewers also want access to the outer courts so in steps The Tennis Channel app. At the French Open, Wagner said, “Usage by devices was topped by the desktop, primarily those at work from 9am to 1-2 pm EST, then is the evening, connected TV usage went up.” Ware said, “At Wimbledon, we spilt rights with ESPN. There is no separate over the top authentication.” ESPN offered OTT for the first time during the recent 2015 Cricket World Cup. Implementing an OTT solution presents challenging issues such as customer support, credit card processing and refunds, making NeuLion an easy choice when considering authentication. The Tennis Channel’s authenticated TVE/OTT hybrid simulcast model allows anyone to subscribe through a connected device, not just cable subscribers that are locked into a sports tier package. Consumers want both ways. WWE Network, Netflix, Hulu Plus and Crackle offer monthly OTT programming that allow consumers to view the way they want much which is the industry standard. The Tennis Channel has both options. Think of it as your personal or cable operator’s complimentary product. Novel features such as 4K video, next episode auto play or similar content are making 24/7 connected TV everywhere a go to option for both cable cutters and subscribers. The Tennis Channel does their own cutting and clipping of highlights and syndicating of channel content complete with social channels. Ware and Wagner have both found that sponsors want more than banners and digital ads while consumers want fewer ads so the Tennis Channel has a more organic balance and distribution of digital content together with advertising powered by NeuLion. Much like a Super Bowl ad, they can institute highlights of stars like Roger Federer together with preroll ads so as to not overwhelm viewers with sponsor messages when they really want to peruse live and archived video. The 4K enabled devices are coming down in price at Best Buy via tablets and smartphones like the Galaxy 6 in addition to various action cams bringing more affordable digital content to end users. There is still the need to deliver the digital content, compress it and send through CDN, then decompress it and finally stream it which NeuLion does. This creates two business models for monetization. One is a direct to consumer relationship, where the fan pays more for a favorite sport, the tennis outer court matches or baseball game. OTT solves that while traditional TV does not allow it. The other is programmatic ad buys based on trafficking used by NCAA March Madness sponsors, Capital One and Lincoln Mercury. The French Open signed Cap One as the official streaming sponsor to capitalize on this model. Advertisers are looking at digital as a way to reach a mass audience and may be steering away from ads and YouTube, but Wagner shared it can be hard to figure out a true ROI. The Tennis Channel Powered By NeuLion Delivers Wimbledon Streaming Video Directly To Fans. #SportsTechie blog. I asked Wagner if they use sports tech features developed with partners to meet other partner TVE and OTT needs. NeuLion is on their 5th version of platform since 2007. Use cases have played a role with enhancing the platform. Two years ago, the use case for slow motion instant replay was a must have so they took the live stream and produced slo-mo for the World Surfing League as a new feature and fan experience for consumers so they could slow down a wave and see athletic movements like never before. Because they push so much video and content I asked about the use of Big Data and analytics. The metrics of live and historical sports events allows for a robust way of analyzing. With so much data, Wagner joked, “It’s like drinking out of firehouse and still being thirsty.” It depends on what data viewers and subscribers are watching. In order to decipher more data, they first they need to know what they want questioned because precise data equals trends. Big Data can be interpreted any of a number of ways so an ESPN and NBC press release will have different outcomes, the same for Fox and the rest of broadcasters and content providers. Discovering streaming data helps NeuLion partners cite metrics, define success and make their points. Nielson is the only company that companies rely on for TV numbers so everyone in the business are all talking the same currency and using the same measurements. Agencies are also breaking down data differently. With NeuLion OTT services partners can see what users are watching up to the minute and then place targeted video to compliment the query results. This real-time digital feature is seamless and flexibility giving programmers a single platform to understand POV unlike what TV broadcasters can learn. The social piece is exciting because it benefits sport and entertainment communities by augmenting video of highlights and key moments as well as breaking news. During the top five matches played at Wimbledon, Tennis Channel will get fans to vote with social enabling more engagement. A hot topic right now is personal images and video taken at venues. Periscope and GoPro users are crossing a grey area in regards to rights issue. While people are excited about content on TV and at an event, sharing that experience needs to be within the rights of content owners. If a fan takes a selfie at the French Open, or Wimbledon, you most likely own that image but if you share a five minute video clip it most likely infringes on venue, broadcasters and sponsor rights. These issues are something NeuLion deals with each time they broadcast a live event. Finally, the virtual world is the next huge space driven by gamers. Samsung virtual reality lenses take feeds from sports enabling 360 views and pan, zoom and tilt perspectives. The new Star Wars movie is using VR to enhance the fan experience during studio tours. VR enabled sporting events are just around the corner so watch for NeuLion and the Tennis Channel to be one of the first to use it. The Roland Garros 2015 French Open official web site by IBM has a mosaic layout full of content, videos and images of the tournaments won by men’s champion Stan Wawrink and for the her 20th career Grand Slam win, women’s champ, Serena Williams. The #RG15 had 14, 123, 450 unique visitors on all platforms combined viewing 16,830,792 videos. I add these metrics to this story to give you a perspective as to how popular tennis majors are and the need to stream video to satisfy all levels of European and worldwide fans. The best players are tuning up on the grass courts for Wimbledon. Catch all three weeks around Europe of the men’s, women’s and double’s action on Tennis Channel Plus over connected TV, computers, laptops, tablets and other connected mobile devices. 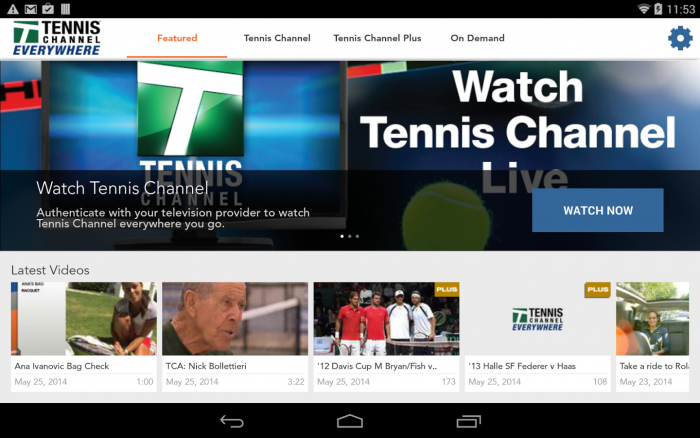 Rather than be at the mercy of traditional TV interfaces by NBC Sports or ESPN while they hop around court to court, subscribers can have their own stream of certain live play with Tennis Channel Plus. Think about whether you will cut the cord and/or purchase a monthly or annual subscription to the Tennis Channel Plus to watch the outer courts at the four majors and their 24/7 yearly content and programming. Or, are you interested in complimenting your existing television cable or satellite contract with a Tennis Channel digital subscription. Either way, subscribe today at www.buytcplus.com.